...a tourist seeks a vendor on the beach. Our friends Carolee, Clay, and Benjamin arrived on Sunday for a visit, and Carolee instantly demonstrated her skill as a magnet for all vendors great and small. They instinctively gravitate to her big open heart (or maybe its the big blond hair). If I turn my back for a minute, I find her surrounded by salespeople hawking everything from ear rings to cigars. She listens attentively to each pitch, examines their wares with respect, and usually pulls out the cash. Then more vendors come. Yesterday she had us all combing the beach at 5 p.m. looking for Mauricio, a vendor she had met the day before. 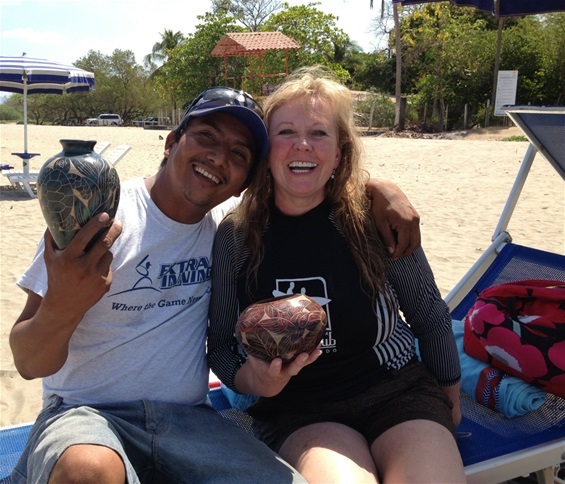 At the time, she didn’t want to haul his pottery all over Tamarindo, so she promised she’d meet him on Wednesday and make a purchase. True to her word, she returned at the appointed time, but alas, Mauricio didn’t turn up til Thursday morning, delighted, of course, to seal the deal which, he had to be thinking, was against all odds.